The state of Arkansas is divided into twelve tourism regions, each with its own association, ranging from the Northwest Arkansas Tourism Association headquartered in Bentonville to Arkansas’s South Tourism Association in El Dorado. The primary mission of each region is to effectively promote tourism by breaking down the county lines that separate the members and create a unified region that can function well as a team. Ozark Gateway, based in Batesville, consists of eight counties in the north central and north eastern parts of the state. The eight largely rural counties that make up Ozark Gateway consist of Independence, Sharp, Stone, Izard, Jackson, Lawrence, Randolph, and Fulton. Each county has a unique history and culture; each also contains a number of attractions, amenities, and natural resources—state parks, lakes, rivers, caves, mountains, museums, art galleries, live music venues, restaurants, varieties of lodging, outdoor activity areas, and annual festivals and events. Each tourism association is led by an executive director supported by a board of directors with representation from each county; Cathy Drew serves as director of the Ozark Gateway; her responsibilities include developing and managing the production of the annual Tourist Guide. Board members assist in this project by providing information, dates of events, and photos for the popular publication; they also assist by selling ads for the guide and distributing the guides in their communities. Ozark Gateway is also especially effective in promoting their region. In addition to distributing the tourist guides in the contiguous tourism regions, they also make them available in all fourteen of Arkansas’ Visitor’s centers. Thanks to its highly successful annual ad sales campaign, the Gateway is able to purchase print, radio, radio, and television advertising. The executive director, board president, and other board members also attend relevant trade trade shows during the year to spread the word even farther. The internet plays a significant role in the Gateway’s promotional effort and as a community resource. Non-profit organizations and communities are urged to submit news of their events and activities to be posted on the Gateway’s website. The site also includes blogs written by board members that cover everything from restaurant reviews to the importance of art in rural communities. The director also puts together and sends out a weekly newsletter with information about upcoming events. Ozark Gateway receives financial support from the Arkansas Department of Parks and Tourism and from their business and corporate partners: Area Wide Media, covering Sharp, Fulton, and Izard counties; First Community Bank and Citizens Bank in Batesville; Future Fuel Corporation and WRD Entertainment, also in Batesville; and the North Arkansas Electric Corporation, a non-profit, member owned utility service that serves several of the Gateway communities. Thanks to this financial support, Ozark Gateway is able to provide grants for its members; matching grants up to $1,000 are available for advertising, publications, and event promotion. These grants are especially important for smaller regional non-profits such as the Batesville Area Arts Council, the Arkansas Craft School in Mountain View, the Ozark Foothills FilmFest, and the annual Main Street Batesville Antique, Arts, and Crafts show. The Ozark Gateway organization has succeed because of strong and unified leadership, strong participation for board members in all eight counties, and enthusiastic citizens and businesses that work hard to make sure that visitors enjoy their experience, whether it is visiting Black River Beads and Pottery in Pocahontas, spend a day shopping at the unique Ozark Classic Craft Mall in Hardy, enjoying lunch at Mexican Mama’s in Batesville, touring Mammoth Spring State Park, being amazed by the Parachute Inn in Walnut Ridge (an airplane repurposed as a restaurant), photographing the rainbow of autumn leaves, exploring the Calico Rock Museum, or going back in time at Jacksonport State Park in Newport, home to an 1872 courthouse. 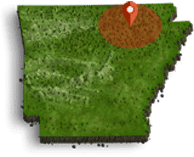 The Ozark Gateway Region will surprise you with its natural beauty, its many historical sites and museums, its impressive state parks, its Bed & Breakfasts, and its friendly, easy-going people. A map of the region that will guide you to our most interesting attractions can be found in the Tourist Guide. Hope you will visit the Ozark Gateway soon; you won’t regret it.